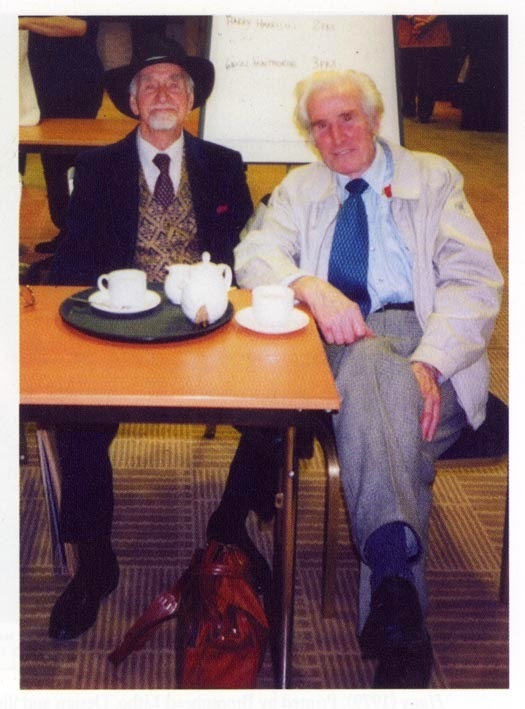 Roger Hall and Sam Peffer photographed in 2005. Roger Hall began earning his livelihood as an artist painting front-of-house display material for cinemas, a career path also followed by his good friend, the late Sam Peffer. Like Sam, Hall moved on to produce book covers and dust jackets for many British publishers and, later, found work with Design Bureau, whose artists were responsible for many of Hamlyn's "All Colour Paperbacks" in the late 1960s/early 1970s. It was here that the two finally met, remaining good friends until Sam's death earlier this year. Roger Hall was born at St Barts Hospital on Boxing Day 1914, the son of a stoker who worked at Wimbledon Power Station. Hall grew up in Islington and showed an early interest in, and talent for, drawing. A few months after leaving school, he became a junior at the London Art Service, a firm specialising in cinema display work. At the age of 15 he worked on lettering huge, 48-sheet posters, banners and other advertising material. After a while, Hall became desperate to move onto the artistic side of the operation in the studios below. One of the firm's artists, Bill Wiggins, suggested that he draw some specimen illustrations to show to the company's chief artist Oscar Brown and, using a Saturday Evening Post cover as his reference, Hall painted a town crier. Brown's terse response was to instruct Hall to "start downstairs on Monday". After an apprenticeship of mixing paint and running errands, Hall began contributing life-size heads to displays, having spent every weekend studying portraits at the Tate and National Gallery. His hero was John Singer Sargent, the top portrait artist of his era and a master at the realistic portrayal of people. After a couple of years, Hall had developed a realistic style that allowed him to accurately paint up to twenty portrait panels a week from publicity brochures and photos. Given his output, he asked for a 2/6d. pay rise—bringing his wage up to £1 a week—and left when the firm prevaricated. Now aged 18, he joined Art Display Services, a new firm based in a former banana warehouse off Shaftesbury Avenue who supplied hand-painted cut-out displays for cinema foyers. One of his most memorable assignments was a 20-foot high picture of Charles Bickford, made up from twelve pieces of 5 x 5-feet plywood, for the Regal, Marble Arch. Hall continued this work until he was called up in 1941. Demobbed at the end of 1946, he joined Pulford Publicity to paint posters. 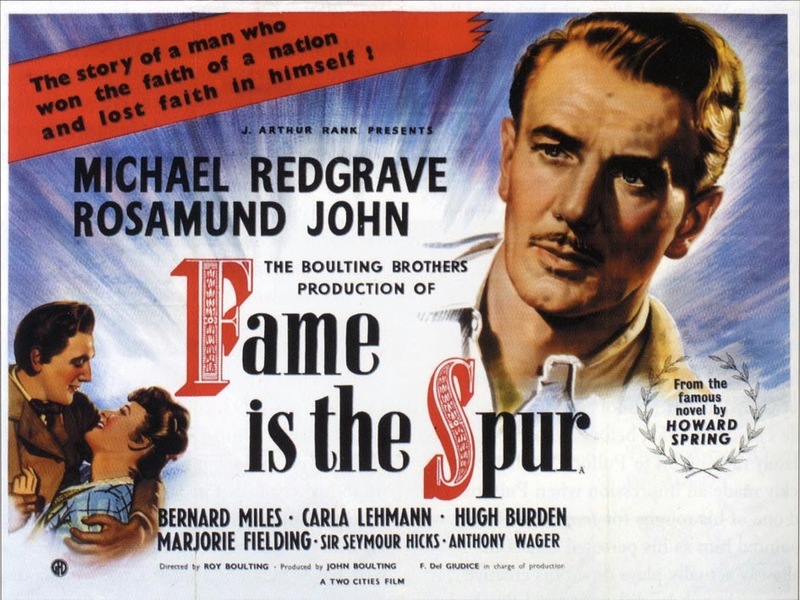 For £16 a week—more than double the average wage— he painted between 200 and 300 posters for the firm, the first a quad poster featuring a large portrait of Michael Redgrave for Fame Is The Spur (1947). 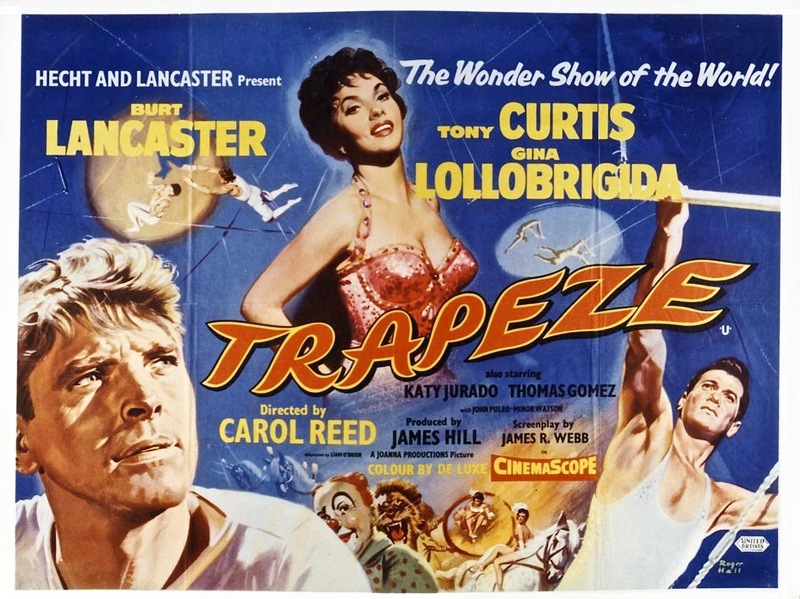 Other posters included Circle Of Danger (1951) and The Adventurers (1952). After producing two or three posters a week for seven years, Hall found himself frustrated by the firm's boss, Eric Pulford, who insisted on designing and laying out all the work for Hall to finish. 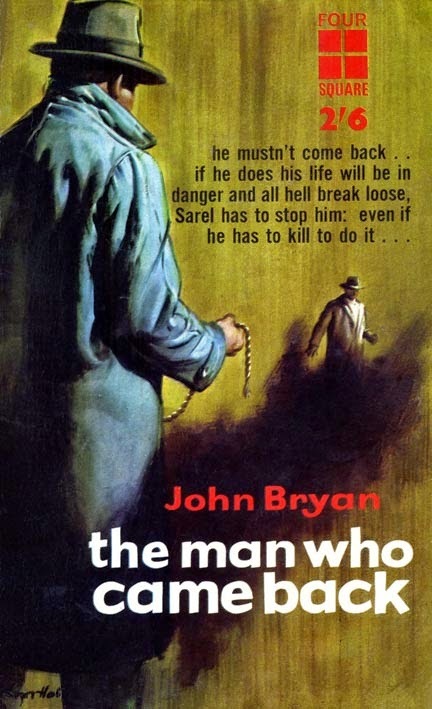 He left, turning to the thriving field of book cover illustration, producing dust jackets for Hutchinson and covers for Arrow, Pan, Corgi, Panther, Four Square, Mayflower and even Mills & Boon. In the 1960s, he returned to painting film posters for Geoff Wright but, due to work commitments elsewhere, passed on the work to Sam Peffer in 1971. 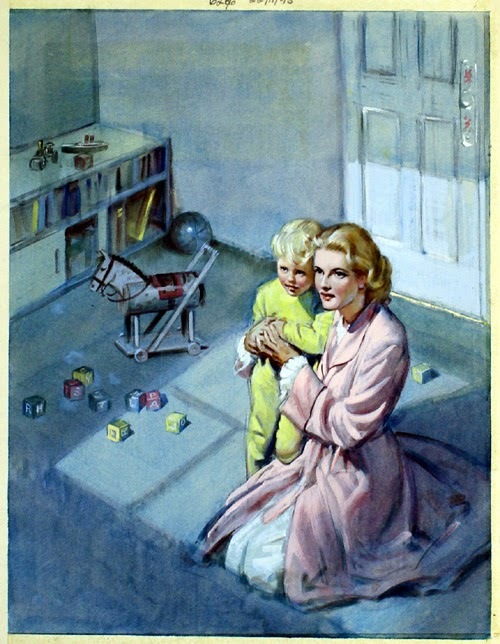 Hall, meanwhile, was working in television and film production work, also illustrating 14 Ladybird books in their 'Famous People' series. Hall also illustrated three popular series for Collins: The Hardy Boys, Nancy Drew and The Three Investigators. 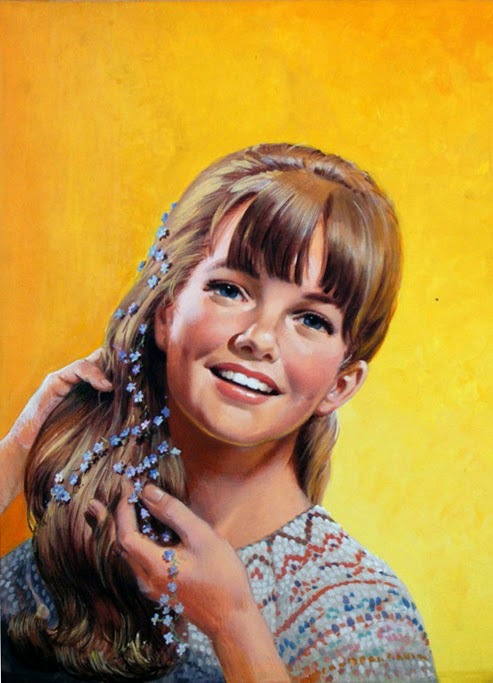 In the late 1960s, Hall contributed cover illustrations to IPC's Princess Tina and, in the early 1970s, painted illustrations for the nursery comic Hey Diddle Diddle. Sam Peffer recalls: "During one of my quieter spells in 1977, a phone call from Roger Hall led to a couple of jobs that gave us both a great deal of pleasure. He had been commissioned to paint murals stretching the length of the walls in two new Safeway supermarkets—one in South Norwood, the other at Blackfen, Sidcup—all expenses paid, and he needed another artist to assist him. Was I interested? I jumped at the opportunity. It was a totally new experience for me, and a very enjoyable one." Hall moved to Spain in 1986, but travelled widely. He held three exhibitions before returning to the UK in 2003, retiring to Gloucestershire, where he continued to paint landscapes and local scenes. 1 The Secret of Terror Castle by Robert Arthur. London, Collins, 1967. 3 The Mystery of the Whispering Mummy by Robert Arthur. London, Collins, 1968. 4 Mystery of the Green Ghost by Robert Arthur. London, Collins, 1968. 5 The Mystery of the Vanishing Treasure by Robert Arthur. London, Collins, 1968. 6 The Secret of Skeleton Island by Robert Arthur. London, Collins, 1968. 7 The Mystery of the Fiery Eye by Robert Arthur. London, Collins, 1969. 8 The Mystery of the Silver Spider by Robert Arthur. London, Collins, 1969. 9 The Mystery of the Screaming Clock by Robert Arthur. London, Collins, 1969. 10 The Mystery of the Moaning Cave by William Arden. London, Collins, 1969. 11 The Mystery of the Talking Skull by Robert Arthur. London, Collins, 1970. 12 The Mystery of the Laughing Shadow by William Arden. London, Collins, 1970. 13 The Secret of the Crooked Cat by William Arden. London, Collins, 1971. 14 The Mystery of the Coughing Dragon by Nick West. London, Collins, 1971. 20 The Mystery of Monster Mountain by M. V. Carey. London, Collins, 1974. 21 The Secret of the Haunted Mirror by M. V. Carey. London, Collins, 1975. 25 The Mystery of the Dancing Devil by William Arden. London, Collins, 1977. 28 The Mystery of the Deadly Double by William Arden. London, Collins, 1979. Freshwater Fishing by Colin Gamble, illus. with Glenn Steward & Sam Peffer. London, Hamlyn, 1972. The Piper of Hamlyn retold by Anthony Toyne. London, Oxford University Press, 1972. Sir Prancelot Goes to Sea by Jane Morey. London, Collins, 1972. Stories of Special Days and Customs by N. F. Pearson. Loughborough, Wills & Hepworth, 1972. Elizabeth Fry by L. du Garde Peach. Loughborough, Ladybird Books, 1973. Michael Faraday by L. du Garde Peach. Loughborough, Ladybird Books, 1973. Charles Darwin by L. du Garde Peach. Loughborough, Ladybird Books, 1973. Roads by James Webster, illus. with Gerald Witcomb & Martin Aitchison. Loughborough, Ladybird Books, 1974. Samuel Pepys by Nicholas Abbott. Loughborough, Ladybird Books, 1974. Bonnie Prince Charlie by L. du Garde Peach. Loughborough, Ladybird Books, 1975. The Story of Our Canals by Carolyn Hutchings. Loughborough, Ladybird Books, 1975. Robert Louis Stevenson by Barbara Brill. Loughborough, Ladybird Books, 1975. Deserts by P. H. Armstrong, illus. with Gerald Witcomb. Loughborough, Ladybird Books, 1976. Queen Victoria by J. R. C. Yglesias. Loughborough, Ladybird Books, 1976. Elizabeth Gaskell by Barbara Brill. Loughborough, Ladybird Books, 1977. Cooking With Mother by Lynne Peebles. Loughborough, Ladybird Books, 1977. The Ladybird Colouring Book of ABC, illus. with others. Loughborough, Ladybird Books, 1978. Marco Polo by Audrey Daly. Loughborough, Ladybird Books, 1980. William Shakespeare by Geoffrey Earle. Loughborough, Ladybird, 1981. Tea by Michael Smith, illus. with David Palmer. Loughborough, Ladybird, 1981. Miracles of Jesus: Loaves and Fishes by Sylvia Mandeville. Loughborough, Ladybird, 1982. Water Into Wine by Sylvia Mandeville. Loughborough, Ladybird, 1982. What a terrific post, thanks very much for this. I'm a huge fan of The Three Investigators and I love Roger's work. Great blog too, by the way! Thanks for this Blog about Roger Hall. He was in Spain a member of the Sugarcane Club of Motril (Granada) between 1992 and 2002 and he made two exhibicions of his late paintings (under the name Henry Walter Hall) at "Caja Rural" and at the Exhibicion Room of "La General", both in Motril. Thanks a lot again for your publication.